A great dish to serve with roti, naans or fried rice. 2. Saute the onions and capsicums for 5 minutes. 3. Add tomatoes, mushrooms and salt. 5. Cook for another 5 minutes. 6. Add chaat masala powder, lemon juice and pepper powder. 10. Serve with roti, naan or fried rice. 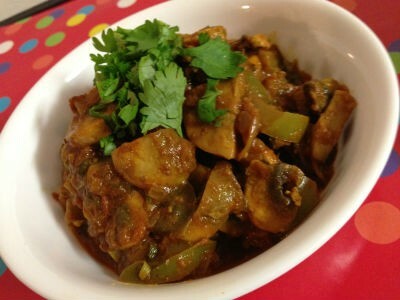 Feel free to comment or share your thoughts on this Mushroom Capsicum Masala Recipe from Awesome Cuisine.